What does that stand for, you ask? “I want what I want when I want it.” Michael Wilhite, SVP of Capabilities at 84.51°, described how always-online smartphones enable consumers to search for anything they want, make purchases at any hour of the day, and complete most of the tasks from wherever they are instead of waiting until they get in front of a desktop. The consumer is used to instant gratification, so even short delays are perceived as inconveniences now. Many advertisers moved away from mobile ads after wasting money on consumers who were converting or ready to convert on their phones per Jeff Allen, President of Hanapin Marketing. He went on to explain that after Google updated their mobile search algorithm earlier in 2015 (affectionately referred to as mobilegeddon) to give preference to mobile-friendly sites in their rankings, consumers’ experiences on mobile browsers have continued to improve. This among other things has helped improve the rate at which mobile users shift their purchase activity from their desktop to their smartphones. It’s happening quickly now so mobile ads should be more effective. If you want to answer the question, “did this campaign move the needle?” (which you do), consider returning to the scientific method. 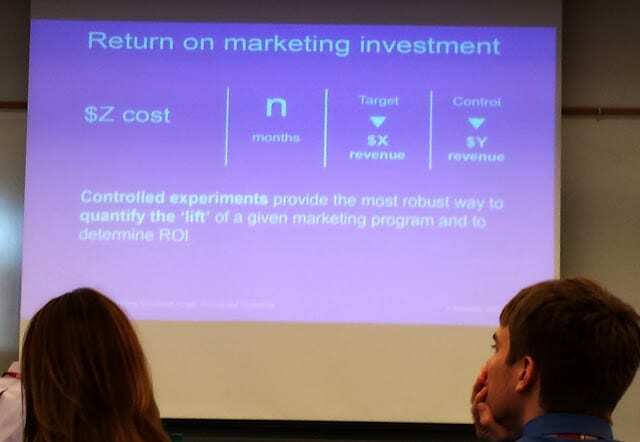 Vaibhav Garde, Principle at FedEx Services, demonstrated how controlled experiments provide the most robust way to quantify the lift that a marketing campaign provides and ultimately to determine ROI. He recommends allocating a small portion of your marketing campaign budget for testing first to prove a concept or channel. Measure the difference your campaign makes for the segment you’re targeting versus the control group that isn’t exposed to the new campaign. Doing so yields a completely different attribution percentage for each channel meaning that the amount of money and resources invested in a given channel should change as well. Did you know more than 75% of videos watched on Netflix are videos they recommend to users? Also, more than 30% of Amazon’s sales come from the products they suggest to shoppers on their site. Recommender systems are an important tool for e-commerce and online businesses, but Assistant Professor of Information Systems Jingjing Zhang uncovered just how much they swaying online consumer ratings and behavior. 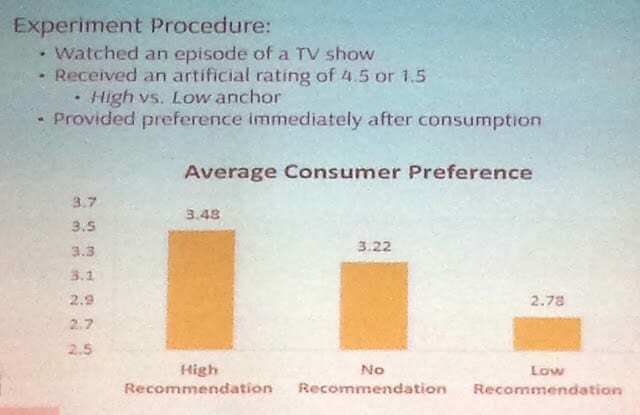 One experiment in her research provided subjects with artificial suggested ratings for a TV show they watched similar to how Netflix provides their estimated ratings for every video based on a user’s viewing and rating history. The study found that ratings were biased towards the suggested low or high rating compared to the control group that did not receive a suggested rating. Businesses need to be careful not to abuse the recommender systems and be aware that their rating diversity may decrease as more consumers are influenced by existing ratings. 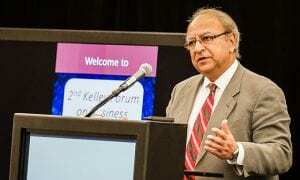 Consumers may lose trust in biased ratings and recommendations potentially harming business. The presenter that really brought this point home was Associate Professor of Marketing Shibo Li. His research was about the effects of group influence on shopper preference and purchase behavior. But it was the topic, but the method of data collection that really stood out: they used a ceiling-mounted camera similar to security cameras to track shopper behavior in a retail store. This enabled them to record the zones each shopper visited, number of people in each group, time spent in each area of the store, age-range, whether a salesperson helped them, and several other pieces of information. Although I admit that it’s slightly creepy, this method makes this previously unobserved data useful for this business and other retail shops. The store can now better understand their consumer giving them an opportunity to improve their layout and signage placement, customer service and operations. It is up to all of us to find ways to make the data already available to us more useful. 45 million users in the United States (and 200 million worldwide) use ad blocking tools online. That is a 50% increase in users over the previous year. Although some businesses are combatting this by asking site visitors to kindly turn their ad blockers off or denying the users the content they came for, the fact is that business needs to make changes to address this change in customer expectations. Michael Wilhite of 84.51° put it well when he candidly shared his feelings about the popularity of Airbnb and other user-generated content (UGC) based businesses, “As a non-millennial, I don’t get it. But it’s not about me getting it. I have to accept that it’s happening and figure out how to adapt. 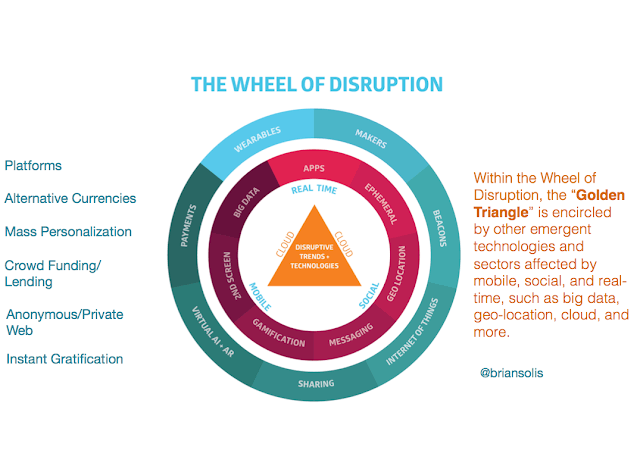 He went on to explain how disruptive forces create opportunity, and the biggest opportunities right now can be found at the intersection of mobile, social, and real-time as depicted in the Wheel of Disruption graphic from digital analyst Brian Solis below. Think about how your business can take advantage of these forces. Pathik Bhatt is an experienced digital marketer and a dual-degree student who recently completed his MBA and is currently pursuing an MS in Business Analytics at Kelley. He started his online MBA when he was living and working in Chicago, and now serves as the Associate Director of Interactive Recruiting for the Kelley Direct Online MBA & MS Programs after moving to Indiana last year. Pathik proudly holds three titles at Kelley: he is currently a student, alum, and staff member.